A well-known homosexual group within the Republican establishment has officially endorsed Mitt Romney for president. Log Cabin Republicans made the announcement Tuesday, stating that it was supporting the candidate for his economic and national security policies. The group said that it communicated with Romney and his campaign before making the decision, and also discussed the matter with other members of the organization. “We are Republicans, and we agree with Governor Romney’s vision for America in which success is a virtue, equal opportunity is ensured, and leaders recognize that it is the American people, not government, that build our nation and fuel its prosperity,” said executive director R. Clarke Cooper. Although Romney has stated that be believes a homosexual relationship cannot be defined as a “marriage,” but feels that homosexuals have the right to be “in a loving relationship and to even adopt children,” the group says they think Romney will be sympathetic to their cause. While a number of homosexual organizations have been angered over the endorsement, claiming that the Log Cabin Republicans are betraying their cause, Cooper said he disagrees. “Those who point fearfully to potential vacancies on the United States Supreme Court, we offer a reminder: five of the eight federal court rulings against DOMA were written by Republican-appointed judges,” he stated. Following the announcement, Romney spokesperson Andrea Saul told reporters that the Romney-Ryan ticket is thankful for the endorsement. “Governor Romney is pleased to have the support of the Log Cabin Republicans and looks forward to working together for the future of our country,” she said. Romney spokesperson Andrea Saul also outlined in August following the Boy Scout’s decision to reaffirm its policy prohibiting openly-homosexual leaders and members that Romney did not agree. She told the Associated Press that Romney still stands by his beliefs that homosexual men should be able to serve in the organization. She specifically noted that Romney had outlined his views in 1994 during a political debate, and that his stance has not changed. 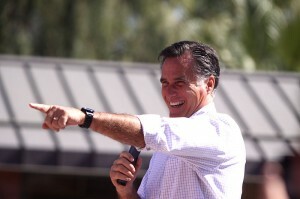 According to reports, Romney has had contact with the Log Cabin Republicans in the past as governor of Massachusetts. Boston’s Edge points out that Romney wrote to the organization in 1994, stating that he was more supportive of the homosexual agenda than his opponent. “As a result of our discussions and other interactions with gay and lesbian voters across the state, I am more convinced than ever before that as we seek to establish full equality for America’s gay and lesbian citizens, I will provide more effective leadership than my opponent,” he wrote.